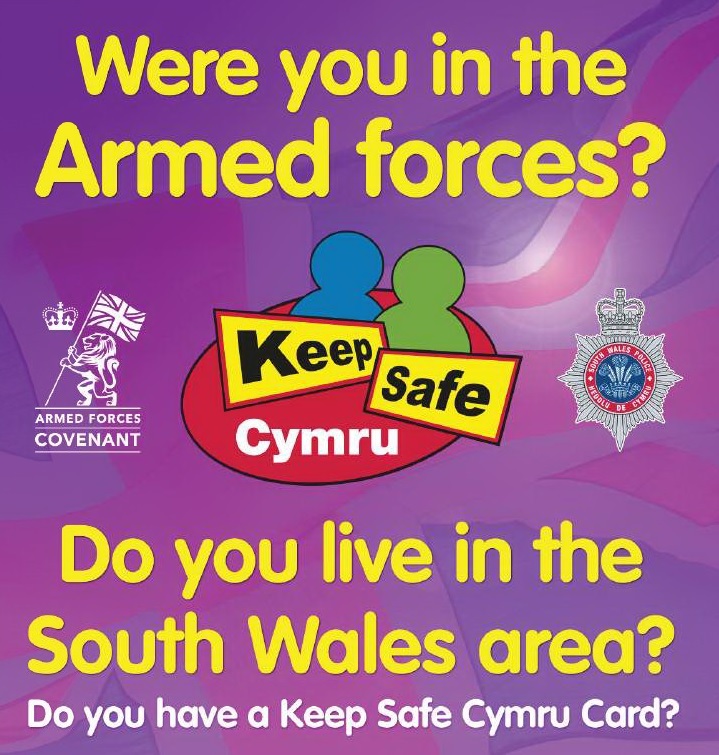 South Wales Police have developed a Keep Safe Card Scheme for Veterans who live in the South Wales Police Force area to support Veterans who may suffer a Disability, PTSD, Mental Ill Health or Dementia. Keep Safe Cymru is a Police owned initiative and is a confidential service where South Wales Police retain information which can be called upon to improve a service to you or your family when a call for service is made or where a mental health crisis may be apparent. This information can also be shared with our partners ie Ambulance and Fire should the information be relevant in a crisis situation or a natural disaster eg flooding. When calling the helpline , the Police call handler will be aware that you have registered for the Keep Safe Cymru Card scheme , and that you have disclosed information under the scheme, which will assist in your support . During the telephone call, the call handler will be able to access the information you have provided on registration for the card. This means the call handler is aware of any additional needs you may have and can pass the information to any resource managing your report. This is not an alternative to the emergency 999 service, it is to be used instead of the non-emergency telephone number only. Police Officers can also access this information at all times on their mobile devices. Upon receipt of a completed form, a card will be sent out to the registered card holder and they may begin using it straight away. This short video taken at the launch of the Keep Safe Cymru Card scheme for veterans.